Posted on July 25, 2013 by bestteacherblog Posted in Common Core, Elementary, High School, Middle School, My Thoughts	. Hello everyone! Sorry this edition of the Common Core Scoop is a few days late! I’ve been busy getting my classroom ready for the upcoming school year and I’m sure you have, too! I did some poking around for recent (and juicy!) 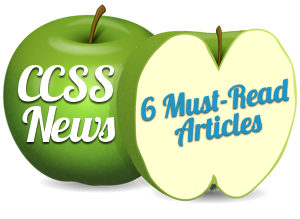 articles on the CCSS and came across these interesting reads. Check them out! Thanks for stopping by the Best Teacher Resources Blog! Have you read any compelling pieces about the CCSS lately? If so, please share the link with everyone in the comments below! Also, don’t forget to LIKE my Facebook page and sign up to receive my FREE newsletter! Posted on July 8, 2013 by bestteacherblog Posted in Common Core, Elementary, High School, Middle School, Online Resources	. If you like to keep up on the latest trends in education, then you’ve come to the right place! The Common Core State Standards are all over the news right now—for good reason, too. I’ve put together a list of six recent must-read articles about the Common Core from various publications so that you can be up-to-date on the banter. If you’ve come to hear my opinion on the standards, I think they’re very good (from what I’ve seen so far). I really appreciate the focus on critical thinking and making cross-subject connections and I think they’ll prove to be a positive step in the right direction. While I may not be 100% behind the way they’re being adopted around the country, these standards are a well-intended effort to improve the quality of learning in the United States. So, now you know where I stand. What do you think? Please let me know in the comment section below!